Brand new Reverb pulled of of a new bike to replace with a longer dropper. Was only in the bike for a couple rides around a parking lot to set up suspension. 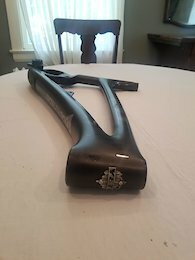 Details Drop: 150mm Clamp Diameter: 31.6mm Lever: Under bar shifter style Buyer pays shipping Message me with any questions.